Dan O’Connor is awe-inspiring. A Vietnam veteran from St. Albans, WV, O’Connor lost the use of his right leg in an explosion in Vietnam and lost the bottom part of his left leg in a motorcycle accident five years ago. He hasn’t let these losses slow him down; instead, he has become an active participant in marathons across the country. O’Connor has competed in over 20 marathons, including five New York City Marathons, mostly utilizing a hand-crank chair. 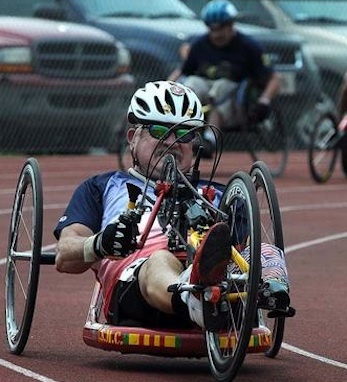 In the 2010 ING New York City Marathon, he placed 64th in the Handcycles division. Last August, he participated in his first kayak race, the Mayor’s Cup Kayak Race, as one of Achilles International’s Touring-Tandem teams. At the end of the Mayor’s Cup, O’Connor placed 82nd overall and placed third in Touring Tandem – Achilles. Not bad for his first kayak race. Achilles International is a non-profit organization that uses athletics as a tool “to bring hope, inspiration and the joys of achievement to people with disabilities.” Besides participating in marathons and kayak races, O’Connor is part of Achilles International’s Freedom Team of Wounded Vets, a program designed specifically for wounded soldiers. When not racing, he works with wounded veterans at Walter Reed Army Medical Center in Washington, D.C..